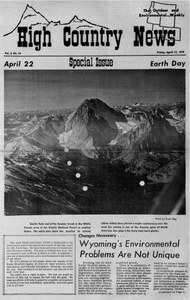 The environmental issues surrounding Earth Day are nothing new to us. But we wanted to join millions of others in celebrating what is hopefully a new direction in the destiny of our planet. We will continue to tell people about the beauty of the Rocky Mountain region, its clean air, clear streams, wide-open spaces, and friendly atmosphere. Wyoming, like all other Rocky Mountain states, is caught in the dichotomous dilemma of development or degradation. The White Clouds area near Challis, Idaho, is under pressure from potential development of molybdenum.